STILLWATER, Okla. (AP) – Officials in Stillwater plan to dedicate a memorial to those killed and hurt in a homecoming parade crash at Oklahoma State University three years ago. Dedication of the Stillwater Strong Memorial is planned Friday to honor the four lives lost and 50 people injured on Oct. 24, 2015. 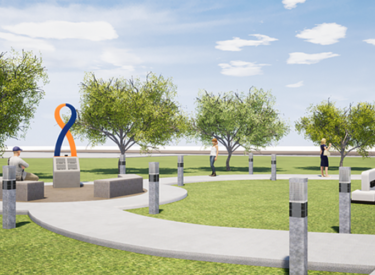 The memorial features a six-foot tall, handcrafted alloy ribbon in orange and blue on a concrete base with four granite tiles describing the lives of the four victims lost. A fifth granite tile on a separate pedestal describes the memorial and the purpose behind the Stillwater Strong effort. Killed were 23-year-old Nikita Nakal from India; 2-year-old Nash Lucas; and married couple Bonnie and Marvin Stone, both 65. Adacia Chambers pleaded no contest in the case and received multiple life sentences last year.